Bow shocks thought to mark the paths of massive, speeding stars are highlighted in these images from NASA’s Spitzer Space Telescope and Wide-field Infrared Survey Explorer, or WISE. Astronomers are finding dozens of the fastest stars in our galaxy with the help of images from NASA’s Spitzer Space Telescope and Wide-field Infrared Survey Explorer, or WISE. The blue star near the center of this image is Zeta Ophiuchi. When seen in visible light it appears as a relatively dim red star surrounded by other dim stars and no dust. However, in this infrared image taken with NASA’s Wide-field Infrared Survey Explorer, or WISE, a completely different view emerges. Zeta Ophiuchi is actually a very massive, hot, bright blue star plowing its way through a large cloud of interstellar dust and gas. Astronomers theorize that this stellar juggernaut was likely once part of a binary star system with an even more massive partner. It’s believed that when the partner exploded as a supernova, blasting away most of its mass, Zeta Ophiuchi was suddenly freed from its partner’s pull and shot away like a bullet moving 24 kilometers per second (54,000 miles per hour). Zeta Ophiuchi is about 20 times more massive and 65,000 times more luminous than the sun. If it weren’t surrounded by so much dust, it would be one of the brightest stars in the sky and appear blue to the eye. Like all stars with this kind of extreme mass and power, it subscribes to the ‘live fast, die young’ motto. It’s already about halfway through its very short 8-million-year lifespan. In comparison, the sun is roughly halfway through its 10-billion-year lifespan. While the sun will eventually become a quiet white dwarf, Zeta Ophiuchi, like its ex-partner, will ultimately die in a massive explosion called a supernova. Perhaps the most interesting features in this image are related to the interstellar gas and dust that surrounds Zeta Ophiuchi. Off to the sides of the image and in the background are relatively calm clouds of dust, appearing green and wispy, slightly reminiscent of the northern lights. Near Zeta Ophiuchi, these clouds look quite different. The cloud in all directions around the star is brighter and redder, because the extreme amounts of ultraviolet radiation emitted by the star are heating the cloud, causing it to glow more brightly in the infrared than usual. 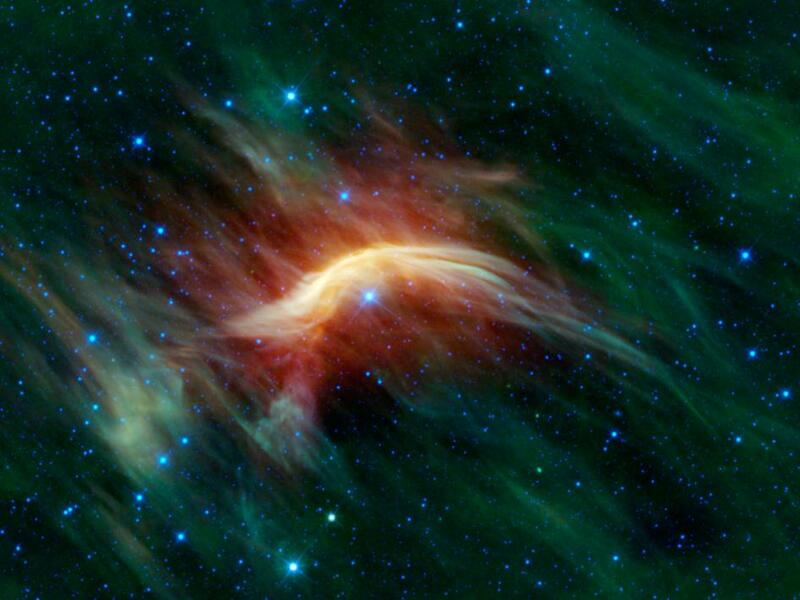 Even more striking, however, is the bright yellow curved feature directly above Zeta Ophiuchi. This is a magnificent example of a bow shock. In this image, the runaway star is flying from the lower right towards the upper left. As it does so, its very powerful stellar wind is pushing the gas and dust out of its way (the stellar wind extends far beyond the visible portion of the star, creating an invisible ‘bubble’ all around it). And directly in front of the star’s path the wind is compressing the gas together so much that it is glowing extremely brightly (in the infrared), creating a bow shock. It is akin to the effect you might see when a boat pushes a wave in front it as it moves through the water. This feature is completely hidden in visible light. Infrared images like this one from WISE shed an entirely new light on the region. Some of the first bow shocks from runaway stars were identified in the 1980s by David Van Buren of NASA’s Jet Propulsion Laboratory in Pasadena, California. He and his colleagues found them using infrared data from the [Caltech] Infrared Astronomical Satellite (IRAS), a predecessor to WISE that scanned the whole infrared sky in 1983. Images from Spitzer, WISE and IRAS are archived at the NASA Infrared Science Archive housed at the Infrared Processing and Analysis Center at the California Institute of Technology in Pasadena.